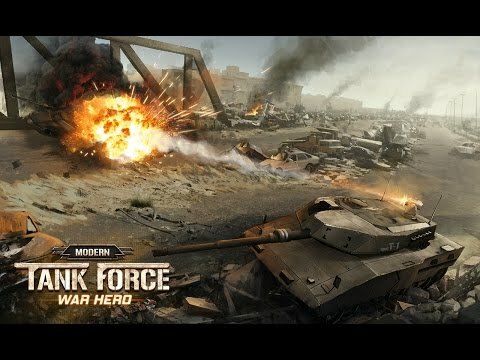 Welcome to Modern Tank Force: War Hero ! On your glorious road to victory, you´ll battle tanks, siege enemy territory and expand your armored battalion to become a force to be reckoned with. One of the best games 2017, period. Do you have what it takes…to be war hero ? In a desert torn by war a true hero is needed. A commander that doesn’t abandon his tank when his gun is still working! Do you have the guts to fight a fury war and liberate this country? An awesome combination of strategy and action In Modern Tank Force: War Hero you can fight yourself through desert tank battles in campaign mode or go all out in a fast paced mode where you can climb the leaderboard by defeating endless waves of enemies. Iconic tanks from all around the world Choose from a wide range of famous tanks depending on your strategy, wrap them in camo and blast your way across the battlefield. Create your battalion wisely and choose from the feared German Panzer, the deadly Sovjet T-90 to the fury Sherman of the Americans and many more! Game features Modern Tank Force: War Hero – 9 iconic tanks from the WW2 era to modern day battle tanks!- Customize your tank with stealthy camo and your favorite flag! – Strategically upgrade your tank with a variety of military grade weapons!- Use power ups like airstrike and flamethrower in your advantage!- Roam around in stunning desert war terrain and battle your enemies!Get ready for the best free games 2017!